As one of over 450 exhibitors, the competition was fierce. 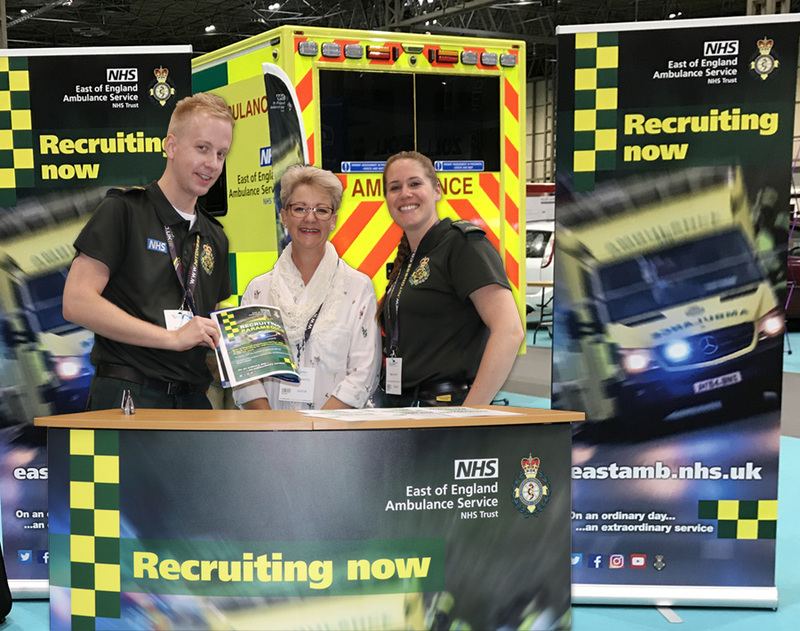 But with over 7,000 visitors across two days for what is the annual showcase of the blue light sector, there was plenty of opportunity to recruit. 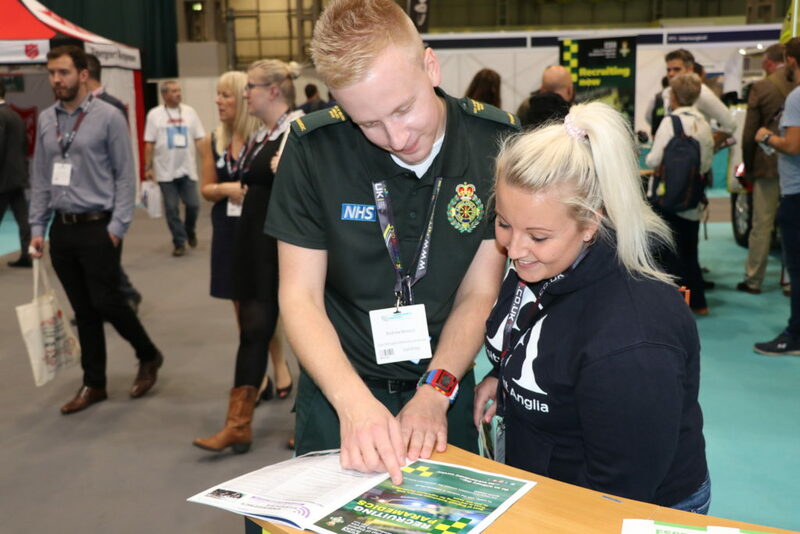 The Trust had a prominent 12m x 6m exhibition space, which we helped furnish by producing a range of low-cost exhibition materials, including pull-up displays, banner flags and counter stands, as well as booklets and promotional giveaways. 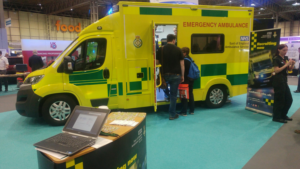 Plus, if you have one – it’s never a bad idea to use an actual ambulance as the centrepiece of your exhibition area! There aren’t too many trade or recruitment fairs that can attract such a high footfall over a two day period. And there’s no doubt that even in a digital age, there’s great value to having meaningful face-to-face interaction with potential new recruits. 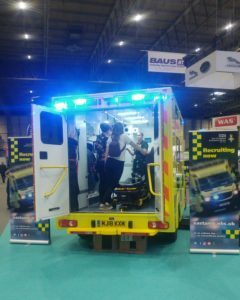 The two days were a big success, with the Trust already pre-booked to appear at the 2019 event. Those were the kind words of Chris Jacob, Recruitment Project Engagement Lead. 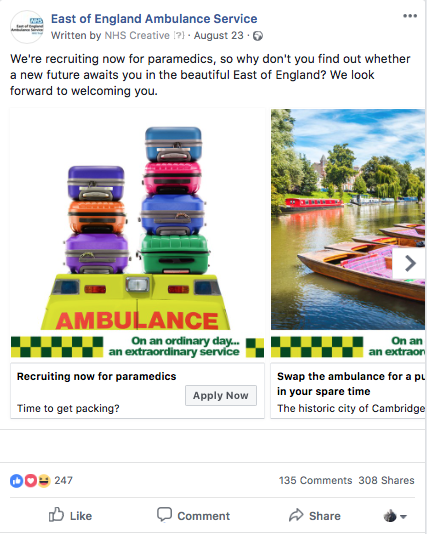 And in addition to the face-to-face approach, we embarked on an extensive online campaign, utilising Facebook ads and Google Adwords to target newly qualified paramedics, experienced paramedics and emergency medical technicians. When it comes to extending your reach (i.e. placing your ad in front of the maximum number of relevant people possible), it really is hard to beat the range and variety of digital advertising options available. The Facebook ads drew a total of 188 comments and were shared 387 times. The entire six week online campaign reached in excess of 300,000 professionals and was seen 1.3 million times, resulting in over 18,000 clicks to the campaign landing page. All of which proves that when it comes to putting on a good show, it’s important to take centre stage in front of as many people as possible – be that in the real or virtual world!